Here we go. A new year, a new beginning, a new chapter, etc... But we can't move forward without looking at where we are CURRENTLY! Here you go, my 2015 currently, courtesy of Farley at Oh' Boy 4th Grade. Listening: To the sounds of silence; interrupted by my typing and the TV noises that drift into my office from the living room. Loving: My massages. I paid for a membership at Massage Envy, one per month. They are worth every penny. Thinking: My to do list is to long, and I never do enough to shorten it. 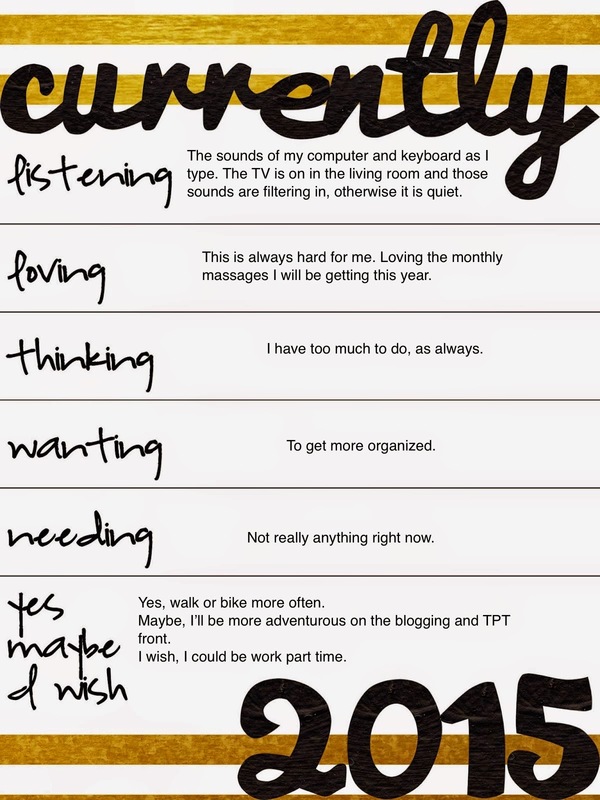 Wanting: To get more organized, see "thinking". Maybe motivated is a better idea. Needing: Really, I am good here. I have a job, house, car, food, family is healthy, some spending money for fun... No need for anything else. Yes: I will start to move more this year. Not exercise in the strict sense of the word; move as in walk to get in 10,000 steps or ride my bike a couple miles a day. Maybe: I will blog more and create more for TPT. I wish: I enjoy teaching, but would love to work part-time. Be a substitute. Heck, I would love to job share with another teacher. Happy New Year. May 2015 be wonderful. Ooh a massage subscription! Brillant. Totally necessary for teachers!!! Love your attitude about the new year. I'm glad you like massages. I never understood them. They don't seem to do anything for me. So if I get any massage gift certificates, you want?